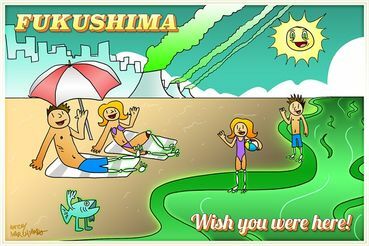 In order to proclaim the Fukushima area safe the Government increased exposure limits to twenty times the international norm. Soon, many Fukushima refugees will be forced to return home to endure damaging levels of radiation. Horrendous but no surprise. Thanks for the story Dandelion. Thank you Dande for the article at site....it took me to an older one about the denial! From a different article link on your news at site! Published in 1980, the book led to my giving many presentations on nuclear power at which I've often heard the comment that only when catastrophic nuclear accidents happened would people fully realize the deadliness of atomic energy. Well, massive nuclear accidents have occurred - the 1986 Chernobyl disaster and the Fukushima catastrophe that began on March 11, 2011 and is ongoing with large discharges of radioactive poisons continuing to be discharged into the environment. Meanwhile, the posture of the nuclear promoters is denial - insisting the impacts of the Fukushima catastrophe are essentially non-existent. A massive nuclear accident has occurred and they would make believe it hasn't. "Fukushima is an eerie replay of the denial and controversy that began with the atomic bombings of Hiroshima and Nagasaki", wrote Yale University Professor Emeritus Charles Perrow in the Bulletin of the Atomic Scientists last year. "This is the same nuclear denial that also greeted nuclear bomb tests, plutonium plant disasters at Windscale in northern England and Chelyabinsk in the Ural Mountains, and the nuclear power plant accidents at Three Mile Island in the United States and Chernobyl in what is now Ukraine." Noted. They will probably justify it by saying the safe levels were way lower than they needed to be and this level is still within. Absolutely horrible and it doesn't surprise me in the least. I feel sorry for all the people. Thanks. Not surprised at all. Thanks for sharing Dandelion. How quickly we forget Fukushima. That radiation will be there forever.....and also in the ocean. I thought Japan used to have the corner on honor. Looks like they've taken a page from America on lying to the public to protect Corporations. Yes, sad and disgusting! If it was only available to the elite controlling corporate rich, I'd be all for it. Yes, radiation accumulates and never leaves, earth, physical bodies. But, Japan and most all the rest of this overpopulated planet, understand and are utilizing a very diversified method of a "cleansing process" of depopulation. This is just one. The elite ruling force needs what's left of natural resources, particularly drinking water. To buy them time to allow Earth to repair, heal, and then if and when that fails, to refine method of leaving it. To succeed they've become aware that they can no longer share it with the masses. There's only one thing they need from us---our absence. Thanks Sheryl. Noted with disdain, anger, frustration. Must be terrifying news for those poor souls. Noted & posted. Of course deny, deny, deny that the radiation levels aren't being globally distributed by ocean currents and prevailing winds.